Well, we have finally started to dip into our collection. 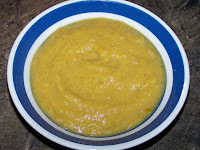 I used two to make "Cinderella Stew" for Thanksgiving, and I've used another one to make one of our favourites - Pumpkin Soup. Knead the butter and flour together. Add all ingredients together in pot on stove. Heat, but do not boil. Serve at once. Now, I don't really measure my ingredients. I just kind of dump in this and that, until it tastes good. ;) I had a whole pumpkin, and I used 2 boxes of Campbell's Low Sodium Chicken Broth. I did use butter & cream when I made this, but since I found out I'm allergic to milk, I won't be adding those in the future. 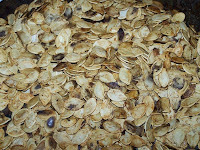 And, of course, when you make Pumpkin Soup, you also need to make Roasted Pumpkin Seeds! Mix all ingredients together in a small bowl. Spread onto a baking sheet. Roast at 250F for about one hour, or until dry.